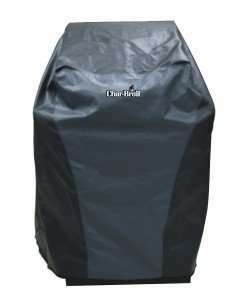 The Char Broil 2 burner grill cover is very popular because it will also fit many other grills perfect. It also fits perfect on the 2 burner infrared grills and grills of many other brands. The most sold gas grills are the ones with two burners so it makes sense that many people looking for a quality 2 burner grill cover for their grill. This 2 burner custom grill cover is mad of heavy duty vinyl and the inside is covered with a polyester based fabric that will protect the cover form scratching your grill. The straps are perfect and do prevent the wind from getting under the grill cover. The size is 31-3/4 x 25-3/4 x 41-1/2 inch (lxdxh) and this will fit a lot of 2 burner grills. Measure your grill to be sure it will fit your grill. “nice weight, feels sturdy. quite sure it will protect my grill. Easy to get over grill and comes with 2 velcro tabs on either side @ the bottom to prevent cover from blowing off if it gets windy. We always look at the low ratings to see what they have to say. The older reviews mentioned that the cover was to short and did not cover the grill all the way to the ground. The newer model seems not to have that problem anymore. 4.5 stars from almost 550 buyers gives me the impression that this is a pretty good deal for the price you pay for it. 5% gave it a lower rating than 3 stars. That means that 95% gave a 3 star or higher rating and that is pretty good. Our advise is always to check your grill cover right away and try it on you grill. If it does not fit or you don’t like it for some reason send it back. This Char Broil 2 burner custom grill cover seems to fit a lot of grills from other brands also. Before ordering measure your grill to make sure it is the right size and we advice to check the height in particular after reading the complaint of it being to short. The used material get some good remarks for the quality and sturdiness and this is ofcourse one of the main reasons we buy a grill cover. There were some remarks in the lower ratings about leaking so test it with a garden hose is our advise. Read all our BBQ and grill cover reviews here.